The ultra-nationalist Right Sector movement has decided to become a political party, while slamming current authorities in Kiev and demanding early parliamentary elections. 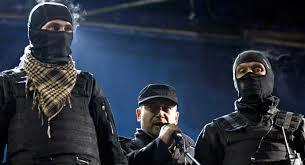 The group has nominated its leader, Dmitry Yarosh [centre, Maidan square, February 2014], as a presidential candidate. He added that the leaders of UNA branches – the Ukrainian People’s Self-Defense (UNSO), a paramilitary force, and Trizub (the ultra-right Stepan Bandera All-Ukrainian Organization) – have agreed to join the Right Sector.